N. K. Blazevic was born in Montreal and currently lives in Saint-Andre-D’Argenteuil, Quebec, where she has become a passionate beekeeper. She studied art for a year in college but she could not nurture her talent or interest there. She was much more interested in being outdoors. She fled to the countryside of the Quebec Laurentians where she apprenticed for a stone mason and cultivated her love of art and animals. She considers herself a student of life with a keen interest in the natural world. 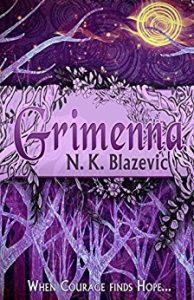 She hopes her book Grimenna can not only entertain and enchant readers, but can help to promote a green renaissance.